The MV Origin is a first class boat that has recently been awarded Relais & Chateaux status. The MV Origin is our favourite Galapagos boat that truly offers a first class experience of the magical islands. The MV Origin is a first class Galapagos boat that combines luxury with a unique and personalised touch ensuring that your once-in-a-lifetime experience is truly remarkable. The MV Origin is the first ever Galapagos boat to be awarded Relais & Chateaux status. The boat also has the best guide to guest ratio - they provide a guide to every ten guests and employ the most experienced staff. The boat also has a full-time concierge aboard to look after your every need. Put simply, they leave no stone unturned and this boat is remarkable. 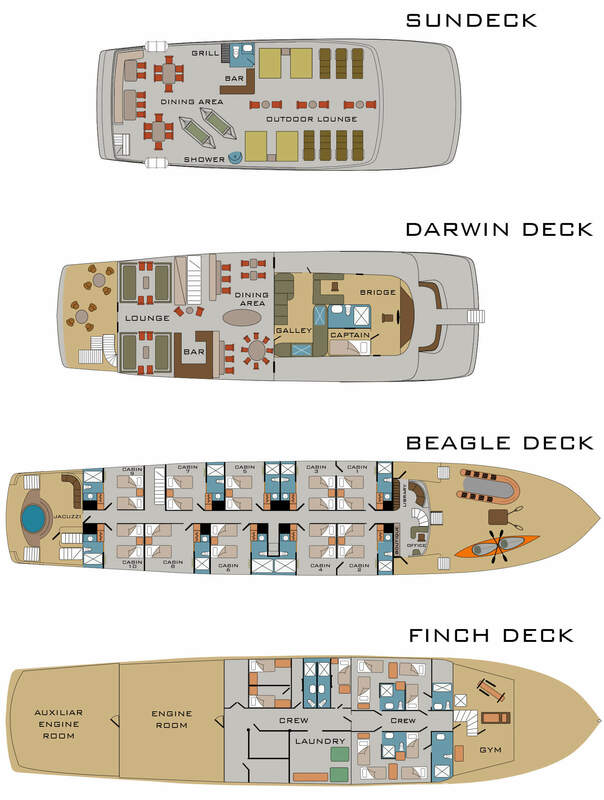 This spacious boat is 142 foot in length, with 10 beautifully finished, sumptuous staterooms. They come complete with en-suite bathrooms with hot water, individual air-conditioning and large panoramic windows. They are super comfortable cabins to sleep in after a day exploring the enchanted islands, and ensure that you wake up to beautiful views feeling refreshed. The boat also includes a jacuzzi, a small bar, a couple of social areas complete with large sofas, a little library, and our favourite - an outside deck complete with hammocks, deckchairs and day beds, and with ample space for everyone. The food is gourmet, (certainly not the norm in Galapagos! ), and can be served indoors or al fresco. Weather permitting they have a BBQ on board too, which gets fired up a couple of times during a one week cruise. There is an open bar policy (also otherwise unheard of here usually!). For the ultimate private experience for you and a maximum group size of twenty then consider chartering this magnificent boutique luxurious cruising ship. Have a look at a video of the MV Origin to whet your appetite for this fantastic ship and luxury expedition vessel. Just click on the play button underneath the large pictures.